In the early years of the church building gifts were donated to enhance the internal appearance. 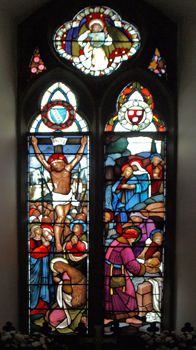 A set of stained glass windows was placed at the East end of the building at a cost of £500. These represent the trial, passion and crucifixion of Jesus. They were donated by Mrs Wild, Mrs Horton and Mr H Hall in memory of their mother, Mrs Lawrence Hall. A 'tracker' organ by Conacher with three manuals was added at a cost of £600. This was extensively rebuilt by the makers in 1935 who converted it to electo-pneumatic. The brass lecturn was given in memory of Mr Lawrence Hall. A new pulplit was donated in memory of Mr James Whittaker - a former churchwarden. These were both given by Mrs Starkie.